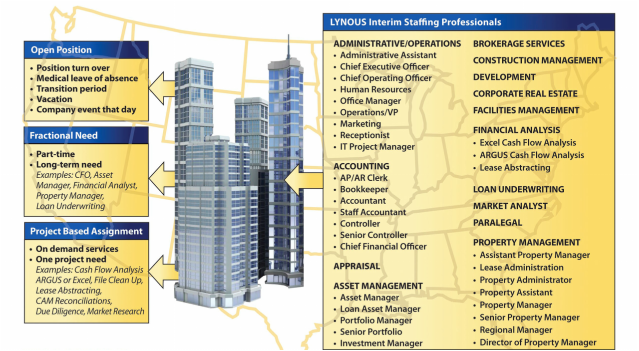 LYNOUS provides experienced real estate professionals on a interim temporary basis from Receptionist to CEO for companies across the United States. Our clients think of LYNOUS as their "virtual bench strength" to help them aggressively manage the ebbs and flows of their staffing needs for: open positions, fractional needs and project based assignments. We provide flexibility to clients providing our real estate services by the hour--so hire us part-time or full-time. With a team of seasoned and pre-qualified real estate professionals in the LYNOUS' national network, we can provide your company with the talent you need to address your specific requirements. LYNOUS interim real estate professionals bring the critical specialized skill sets needed during a heightened time for our clients and find it personally gratifying to add immediate value to a situation.